Engine No 211 - "Portuguese"
GECP - the group of train enthousiasts that operates the "Train des Pignes" steam train in Puget-Théniers - has now its most powerful steam engine in operation. This locomotive was built in 1923 by Henschel & Sohn - in a series of only sixteen units - for Portuguese Railways. It was in the 1970-ies based in Sernada where it was used to pull passenger and freight trains on the lines Val de Vouga/Espinho to Sernada and Aveiro to Viseu. In 1975 it was transferred to Lousado, where it provided service on the line Famalicao to Povoa de Varzim. After being transferred to the central workshops in Puerto Campanhã it underwent its last revision in service in 1976. Later on it was based in Regua where it pulled mixed trains and work trains on the line Corgo Regua to Chaves. It was taken out of service in 1981. Three years later, the Portuguese Railways offered to sell twelve steam locomotives no longer in use. One of them was the E 211, offered to and bought by GECP. It was in July 1986 towed from Regua in Vila-Real to Puget-Théniers. At GECP it was used in the "Train des Pignes" steam service from 1988 to 1992, when it had to be retired for necessary, costly repair. The financing of the repair/restoration took time to find and it wasn't until more than 10 years later that it could start. The restoration was done in Italy, at the workshops of Lucato Térmica in Castelletto Monferrato in Alessandria Piemonte and finished in late 2009. 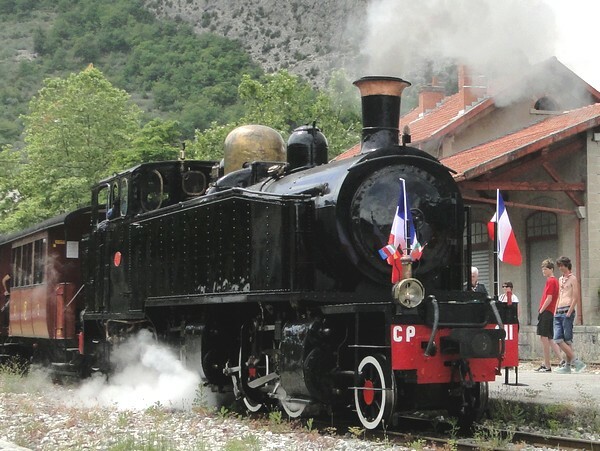 Since June 19, 2010 this impressive locomotive is back in service, to pull the "Train des Pignes". More on this steam engine in this post.